Would definitely purchase this tan again! It doesn't smell at all (like most tans) and goes a lovely colour with just one application. I hadn't tried this before but decided to give it a go after a couple recommendations and thank goodness I did! Absolutely love it, so easy to apply and develops into the most gorgeous colour. Feel like a bronze goddess! Before purchasing this tanning product, I had never tried a liquid tan as I was always sceptical about this however I have fallen in love!! Glides on smoothly and doesn't go patchy and lasts for about a week. There is no other like it ! Definiely to be recommended. 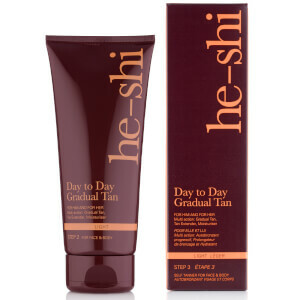 A tan which is easy to apply, great colour and no streaks or smell !!! And.,... when it s darkened it just looks so normal and makes you feel just WOW !!! Absolutely the best you can get! Changed my life! Love love love. It!